The government has been circulating revised web-blocking powers for the Digital Economy Bill with industry and activist groups, and The Register has seen a draft. This version is believed to have won the backing of the Tories, and could end up in a Second Reading. The revised Clause 18 we’ve seen is a hybrid of the earlier Clause 17 (which was defeated) and its successor, the Tory/Lib-Dem Clause 18 (which was withdrawn). Ben Bradshaw’s latest draft gives the Secretary of State the power to allow Courts to grant injunctions against service providers compelling them to block “internet locations” – but only after a Parliamentary vote, and with a lot of conditions to be met. These may not satisfy the rights holders, as it limits the scope of a possible injunction to one or two circumstances. The original BPI proposal, which you first read about here in January, looked a lot more like the US-style DMCA, which places the presumption of guilt on the service provider, and can result in large chunks of the internet disappearing based on one simple form. (See Record labels seek DMCA-style UK takedowns). And of course, it’s hugely uncertain whether the revised Clause will survive Wash Up. Some words to go with some photos from the Open Rights Group demonstration at Parliament. LibDem peers agreed to drop their controversial net-blocking clause from the Digital Economy Bill after the government advised that the proposal would be legally unenforceable. It means the Bill now heads for the Commons with one of the key copyright infringement countermeasures up in the air, although it’s likely to be a return to Plan A (ministerial superpowers) rather than judicial oversight by the Courts, as the LibDems’ Plan B proposed. The original Section 17 was written to deal with music and movie business concerns that a third of infringing material was being downloaded via cyberlockers, such as RapidShare. It gave the Minister considerable powers to order new countermeasures – extending copyright law on the hoof. A clearly exasperated Lord Clement Jones, who had tabled the replacement Clause 17, said he’d done so in response to the concerns of internet activists, such as the ORG, who had objected to the ‘Ministerial Superpowers’. A little-reported corner of the sprawling Digital Economy Bill reduces photographers to serf status – and concerns are rippling into the wider community. Photographers say bad wording and technical ignorance are to blame for Clause 42, calling it a “luncheon voucher” for greedy publishers. “The Bill contains no deterrent to the creation of orphans, no penalties for anonymising your work, no requirement for bylines. It is a luncheon voucher for industry hungry for free and cheap content,” writes professional photographer Tony Sleep. He told us the bill legalises the machinery for creating bogus orphans works. Photographers have many concerns, and say that two separate ideas have been munged together – extended licensing and orphan works. What the Mandybill does is formally regulate orphan works, copyright material where the author can’t be found. It also grants special status, complete with immunity, to institutions to publish the works. One of which happens to be the BBC, suggesting it isn’t simply museums or libraries who’ll be the beneficiaries; the BBC is a commercial organisation with £1bn in commercial income last year. One problem photographers see is that most computer software strips the metadata from digital images, creating an instant “orphan” work. “Orphans being mass manufactured. The author becomes invisible; so copies on web just belong to nobody,” says Sleep. “The original reason for orphan works legislation is reasonable, and nobody argues with the need of museums and maybe educational to access work they can’t get to,” Sleep told us. “But what we’ve got appears to have the heavy duty interests of big publishing written all over it. The extended licensing means exclusive rights holders can give up those rights for a collective scheme. It’s voluntary, Sleep acknowledges, and people can opt-out. Naturally, the organisation that already administers rights for visual images has welcomed the move. DACS, the UK collection society responsible for distributing money, could enjoy a much wider role. But Sleep fears mission creep, with powerful publishers such as News International, or digital aggregators like Google standing to gain hugely from the legislation, at the expense of the creators. No one has pushed harder for the change than Google. Indeed, it isn’t hard to envisage Google becoming a kind of New Age one-stop collecting society – one that sets its own rates (because of its immense market clout) and one that is beyond the law. Most collection societies today are member-owned nonprofits and subject to close state and EU scrutiny. A year ago we warned that the Google Books settlement provided a template for such an organisation. 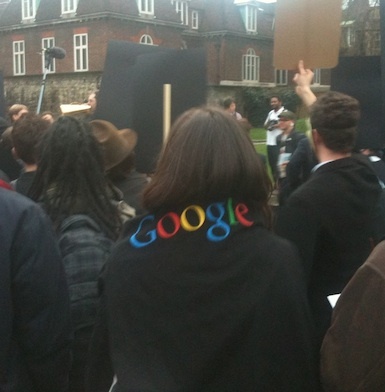 Now that Google is writing UK legislation, it looks much closer. It’s these latter concerns that make music and film creators anxious. “Civil servants didn’t realise Clause 42 said what it said,” one music business source told us. The Lords are due to chew through the final part of the Mandybill on Monday. But Sleep isn’t optimistic. “We’ve been consulted for six years, and still they ignore us,” he said. The LibDems’ surprise amendment to strengthen UK courts’ powers over digital copyright infringement passed late last night, despite Labour and Tory opposition, replacing the government’s original, preferred proposal in the Digital Economy Bill. Out goes the ability of the Minister to extend copyright legislation by statutory instrument – something earlier Ministers have already exercised, in practice. In comes the ability of the courts to block network addresses based on infringement notifications. Two LibDem peers have tabled an amendment allowing the Courts to grant injunctions against ISPs – blocking off sections of the internet found to host infringing material. It’s similar to the DMCA-style proposal punted by the BPI in the new year, which we exclusively revealed. Injunctions are already a legal tool against infringement, but the LibDem Lord gives them a new scope and spin.